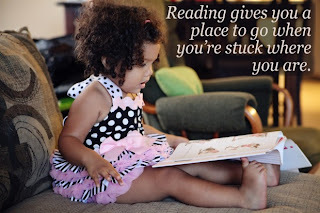 The Relentless Reader: Why Read? things to the people I love. Why do I read? How could I not? It's the best way to learn about other people, places, experiences. It's the only way I might ever get to Paris or New York. It's the best way to sink into someone else's mind and understand where their ideas and attitudes come from. How else can I learn all the things I want to learn? How else can I learn things that I didn't even know that I needed to learn? Reading is the best way to understand our humanity, our history, ourselves. 42% of college graduates will never read another book after they are done with school. That is immeasurably sad to me. If only they knew what they were missing. That statistics about collage graduates is shocking! This is especially disturbing in light of the fact that so many people watch so much television. I think reading, as opposed to doing "easier" things is like cooking a meal from scratch with real ingredients as opposed to heating something out of a box. It takes more time and effort, yet in the end, it is usually well worth it. I also read for many of the same reasons that you do!